Know what I’ve been doing in my spare time? Arranging a movie screening. Seriously. I’m super excited about it. 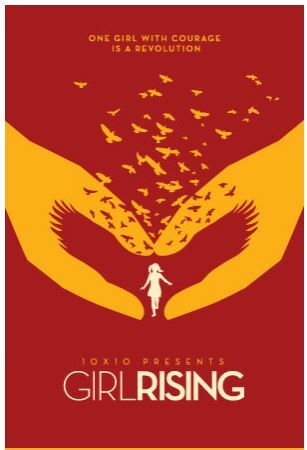 A group of women from my work have come together to make this happen, and I’m leading the project to bring the movie Girl Rising to Reno on Thursday, June 6. I mentioned before that I was getting involved with the local charity, Think Kindness. The CEO of Think Kindness, Brian Williams, offered to partner with us to host the screening, and thankfully he has hosted charity movie screenings before and he is laying all the framework for this to happen. The event is also sponsored by the Junior League of Reno, who is helping to promote the event. Girl Rising journeys around the globe to witness the strength of the human spirit and the power of education to change a girl – and the world. Meryl Streep, Anne Hathaway, Selena Gomez and other acclaimed actors contribute voice performances to the film, which features original music from Academy Award winner Rachel Portman and Grammy Award winner Lorne Balfe. Watch Girl Rising, and you will agree: One girl with courage is a revolution. You will walk away feeling an overwhelming sense of pride, triumph and many other emotions. Invite your friends, daughters, sons, nieces, nephews, mothers and fathers — share the power of education. Please note the film is rated PG-13. If you live in Reno, please join us for a night that could very well change your life! I have been making my way through the TEDx videos from the event that took place at the University of Nevada, Reno back in January. When I saw the video by Brian Williams of Think Kindness, I just knew that I wanted to support his cause. I am an inspiration to the people in my life, modeling how to make a noticeable, positive impact in this world. I have so many facets of what that means, with goals on achieving that vision in my career, family and friendships, health, community and with my creativity. One of my goals was to find an organization that I wanted to support both financially and with my volunteer hours. I believe I have found that match. I met Brian and his assistant during lunch yesterday, and had a very exciting conversation. Think Kindness is a non-profit organization dedicated to inspiring measurable acts of Kindness in schools and communities around the world. We had a long conversation, as Brian told me about the work they do to improve the lives of students and children locally, but also in Kenya. As he talked, I thought of so many ways I could get involved. The most exciting program for me is where his organization goes into schools and creates a “Kindness Takeover”, challenging kids to do as many random acts of kindness as they can. He also has a way to measure the impact of a single act of kindness, through Kindness Cards. Each card has a tracking code, and if you receive an act of kindness with the card, you are asked to go to their website, put in your code and say what act of kindness was done for you. And then you pass it on. What I learned last week is that it fuels my energy when I am volunteering in the local schools and giving back. This program is the perfect vehicle for me to make a positive impact while doing what I love. I’m such a believer in Random Acts of Kindness that I even put up a category on this blog a while ago, and I had intended to do acts of kindness to document here. But alas, I got side tracked. I did numerous acts, but never got them up here. I am so happy that Think Kindness has provided me with a structure around these acts, and I am happily buying up the cards to start my own little kindness revolution. You know what else is exciting? I pitched the idea to Brian that I could write a book about kindness for children, and partner with him to take the kindness message into schools through book readings. He loved it. Now I just need to write that book. You know what I’ve found this year? Working with the executive coaches and getting a crisp vision on what I want out of life, and what goals I need to achieve to get there, is working. I’m making progress, and you know what? I’m happy. And to me, that the key definition of success. I stumbled upon the Random Acts of Kindness website earlier this week. They have ideas on the site of things you can do to make a positive impact on the lives of other people — even if it is small. One of my core values is that I want to make a positive impact on this world. I keep this blog not only to have a home for my writing, but also to keep a record for my children to read one day. So with that in mind, I am going to start writing about the little things I do occasionally to make someone else smile. Hopefully it will inpire you as well. I started off my crusade yesterday. Ironically, I was already scheduled to donate blood. As I was leaving the United Blood Service, the man who had been donating next to me stopped me and asked if I could give his car a jump start, as he had a dead battery. Of course, part of me momentarily thought I hope he’s not just luring me towards his car, but I went with my gut, and promptly popped the hood and got out my jumper cables for him. Bam. Two good deads in the karma bank. It feels good. Definitely had me smiling the rest of the day. I’m hoping it helped someone with a pick-me-up for their afternoon. Please let me know what your ideas are for Random Acts of Kindness!